Aika In October. - Welcome to The City of Desire. 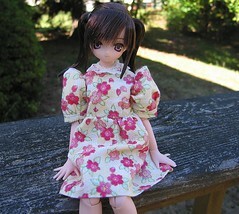 Aika is probably my least favorite of the Ex Cute girls, but I still think this doll is cute! Aww, I really like her (she's got a naughty look to her eye) but maybe it's her cute hair? Also, nothing wrong with sneakers and dresses! Thank you! She does have a really cute facial expression, but I wish her eyeprint were as detailed as some of the newer dolls'.